Mr. Mahendra Singhi has been associated to the growth and development of the cement sector in India for the last 41 years. Since 2013, he is the Group CEO of Dalmia Cement (Bharat) Limited, a major group in India globally recognised for its low carbon footprint cement production, water positive operations and bold ambitions &amp; achievements on sustainability. 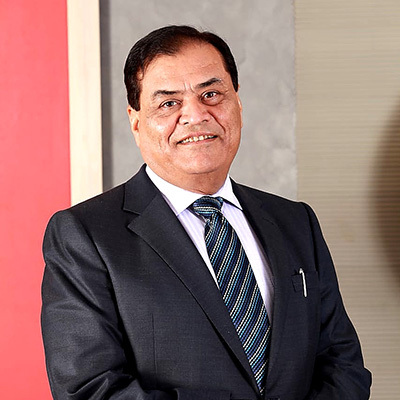 Mr. Singhi is also serving as Vice President of Cement Manufacturing Association (CMA), a leading body representing about 450 million tonnes of installed cement capacity in India. He also serves as a Chairman of National Council for Cement and Building Materials (NCCBM), a leading building materials research body in Asia. Mr. Singhi has also served as Co-Chair of Cement Sustainability Initiative (CSI) in India. The entrepreneurial abilities of Mr. Singhi and his deep understanding of cement business has helped corporates to chart new growth territories and achieve market leadership. His expertise lies in motivating and leading businesses to unleash their full potential. A visionary and advocate of sustainability, Mr. Singhi has been the driving-force in inculcating this concept in the objectives and operations of the cement companies he has worked with. Today, leading Indian cement companies are setting global benchmarks in climate protection and energy efficiency. This is the result of long efforts of business leaders like Mr. Singhi and, the results are overwhelming. For example, Dalmia Bharat has been ranked # 1 cement company across global cement sector by award winning research series of CDP (Carbon Disclosure Project) on business readiness to low carbon growth. Mr. Singhi is the frequent speaker in various national and international events on climate protection and sustainability to highlight the business actions and ambitions. Mr. Singhi represented the business and cement sector during COP and High-Level Government-Business Dialogues of French Presidency, Governments and United Nations. He was one of the business invitee from India to attend the Paris Climate Agreement Ceremony from Ex. Secretary General of UN Mr. Ban ki-Moon. A positive thinker and strong supporter of happiness culture in the organisation, Mr. Singhi promotes innovative ideas and research. He deeply believes research has the potential to eradicate climate change impacts and create future opportunities unknown to businesses. Mr. Singhi is a spiritual person, an avid reader of behavioural psychology. Mr. Singhi is a science & law graduate and a Chartered Accountant.